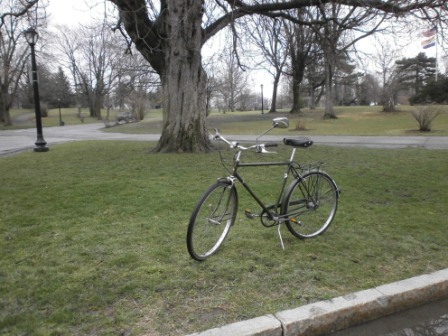 The City of Albany designated the area in Washington Park just east of the Lake House as the “official sponsored site” for Bicycle Expo 2013. With just three weeks remaining before the BIG EVENT, the site planning committee “met under the tree” on a chilly day to map out vendor sites. “Headquarters” will be just to the right of the bicycle in the photo (check the mirror) with prime spots around the tree going to lead sponsors. 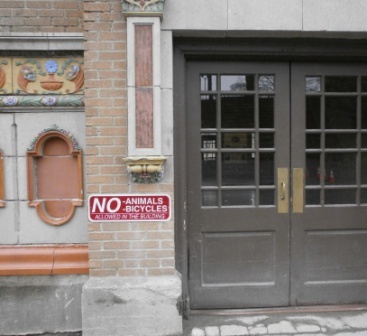 BE-13 guests will be mindful of the pictured sign on the Lake House by not taking their bicycles (or dogs) into the rest rooms.